A great image and POV. Happy easter to you too, Martina. Ahhh, yes, those universal creatures which everything taste like — nicely photographed. Happy Easter. 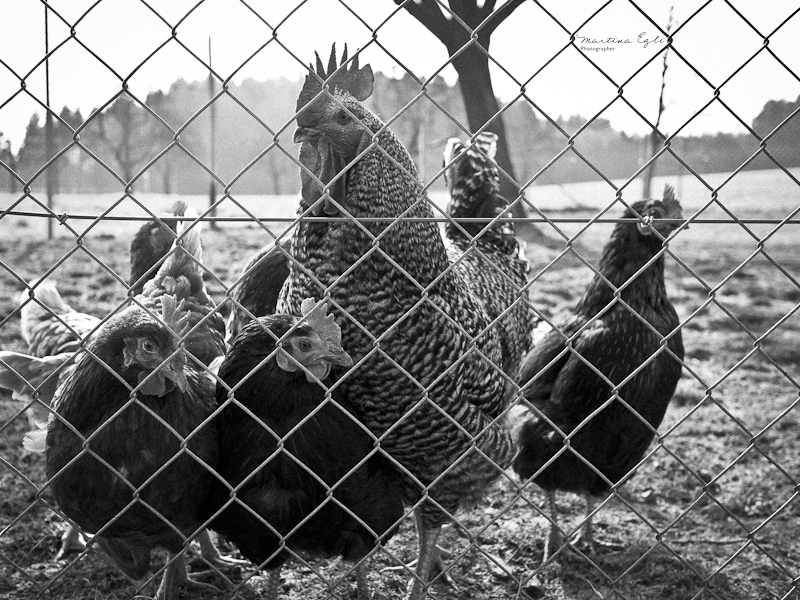 The fare well, the chickens. As a child we had and which I was responsible for them some time. I have even sung them and they looked at me like your in the picture :-). LOL! I guess it’s only fitting that we always give the egg so much attention during Easter …when in all reality we should be thanking the chickens :). Love the photo ME! haha – love it. Hope you had a wonderful holiday Martina. Are we invited for the party so they said:) Nice depiction.. attractive in B&W! OK, so I’m a bit late to the party here, but it’s a cracking image (pun intended). The male so tall and proud with his harem of glamorous lady friends, and the power and beauty of this mono frame which works so well. Perfect vantage point for the shot and tones that really rock, it’s a frame that really appeals, and that’s no yoke…. I just had to get one more egg pun in…. I’ll get my coat!